Your enterprise and applications need to communicate – to collect information from many sources and get data where and when it needs to be, which increasingly means in real-time. Complicating matters, as you migrate applications to the cloud and implement IoT strategies, they need to connect increasingly diverse endpoints and systems running in diverse public cloud, private cloud and on-premise environments. In this webinar, we’ll describe and demonstrate how the Solace Virtual Message Router can give applications and microservices running in Pivotal Cloud Foundry the ability to exchange information using open APIs and protocols like AMQP, JMS, MQTT, Qpid, Paho, REST and WebSockets. 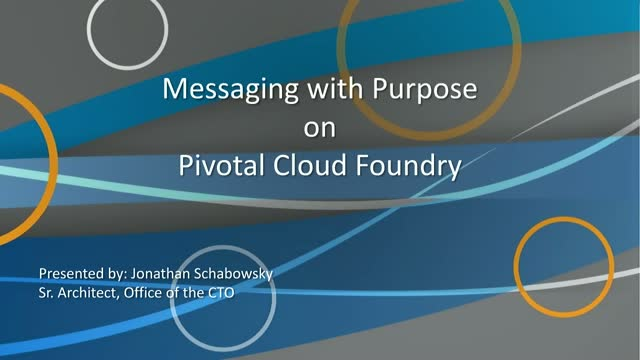 Jonathan Schabowsky of Solace’s office of the CTO will show how easily you can enable real-time communications between microservices with the new Solace Messaging Tile for Pivotal Cloud Foundry and how you can integrate Solace into your crucial data movement solution. Jonathan Schabowsky is a Sr. Architect in the Office of the CTO at Solace. His expertise includes architecting large-scale, mission critical enterprise systems in various domains, such as for the FAA, satellite ground systems (GOES-R) and healthcare. Recently, Jonathan has been focused on the use of event driven architectures for microservices and their deployments into platform-as-a-services (PaaS) running within public clouds. Find out how you can create an event-distribution mesh across all your environments using Solace messaging technology.Solace is making the world's best message broker available for free, and our messaging as a service offer is now ready for deployment in production environments. Watch this important presentation by Jonathan Schabowsky, Senior Architect at Solace, for a fresh perspective on what your IT/OT organization can do to enable seamless and performant data movement across your hybrid cloud. -The forces driving ever great distribution of your enterprise data. -The challenges that growing data distribution pose to your IT agility. -The enterprise and future proofing requirements that you’ll want keep in mind as you navigate data distribution challenges . Solace Systems Architect Tom Fairbairn explains why Advanced Event Brokers are important, and why you should be using them. Today’s communication services providers need to innovate at breakneck pace to satisfy fickle customers who demand more real-time information, and more interactive services, than ever before. They need infrastructure that is not just fast and always available, but flexible so they can quickly and easily incorporate new data sources, cloud services, presentation technologies and IoT devices into their service offerings. In this webinar, Solace’s Amit Gothecha will use customer success stories to illustrate how Solace can help service providers become more agile using event-driven architecture (EDA) and microservices, and keep massive amounts of real-time data moving efficiently across hybrid cloud systems that seamlessly connect cutting-edge cloud environments with legacy on-premise infrastructure. Solace é líder global em mensageria e provê uma plataforma que interconecta empresas de ponta-a-ponta usando padrões de mercado. A plataforma de mensageria da Solace é o sistema nervoso para vários casos de uso onde existe o movimento de dados: nuvem híbrida, microserviços, arquiteturas orientadas a eventos, Big Data, Internet das Coisas entre outros. A Solace é uma solução que suporta múltiplos protocolos, linguagens de programação e padrões de troca de mensagens e que funciona tanto em nuvem pública e privada, como também localmente. Essa abrangência torna possível o que chamamos de Open Data Movement. In the IoT world, being able to collect data from all of your devices is key. However, getting ahead of your competitors means being able to analyze that data to make crucial business decisions. Sigfox, with its global LPWA (Low Power Wide Area) network, has reinvented connectivity for the IoT. And joining that capability with Solace, the leader in data movement and messaging, brings performance, scalability and reliability when it comes making IoT data part of your Enterprise IT and your business value. Join our webinar and see a demo of Sigfox working with Solace to show how Sigfox device data can be propagated to enterprise applications running across different public and private clouds. Join Jonathan Schabowsky of Solace’s Office of the CTO at Solace as he describes how combining EDA and microservices can help you improve all kinds of data flows. He’ll talk about query and command interactions, synchronous and asynchronous communications, and you’ll learn how to make microservices event-driven. Data-driven quant strategies have been around for a while now, but recently we’ve seen a boom in the use of next-generation AI technologies and innovative new feeds to capture alpha. Firms are re-imagining how they think about data, their workflow and value proposition. Quants applying the latest machine learning techniques fed by cloud-based and internal data sources are transforming the make up of today's financial services value propositions. In this webinar Terry Roche from Tabb Group and Keith McAuliffe from Solace will discuss the new technologies that are enabling these quant-based instruments, algos and funds, and explain how technology choices can smooth your path to a fast, flexible infrastructure to execute on quant strategies. So how do you achieve hybrid and multi cloud application connectivity in a simple, robust and secure manner without losing the functionality your applications need? Sumeet Puri, senior vice president and global head of systems engineering at Solace. Data in motion holds unique insights not found in data at rest. That’s why there is increasing importance on data rivers, ways to deliver the value of big data while in motion. But like any river, the big data river is made up of multiple feeds, coming from multiple sources. A true data river needs to support open protocols, multi- and hybrid environments from cloud to datacenter and handle conditions from drought to flood seamlessly. During this webinar, Sumeet Puri will discuss data rivers, lambda architectures, how event-driven architectures flow into data lakes and how microservices enable and are enabled by data rivers. He will illustrate the value and limitations associated with these technologies standards through case studies that draw upon his experience working with customers in the financial services, manufacturing, telecom and transportation sectors. Sumeet Puri is senior vice president and global head of systems engineering at Solace. His expertise includes architecting large-scale enterprise systems in various domains, such as banking, telecommunications, and more recently in spaces related to IoT, big data, mobility, and analytics. Sumeet’s experience encompasses architecting, program managing, designing and developing complex IT systems from portals to middleware to real-time CEP, BPM and analytics. Live from this year's World ATM Congress in Madrid, Wayne Osse, Director, Sales Engineering Americas at Solace, reports on the latest trends in Air Traffic Management technologies and Solace's role in the mission-critical foundation of air traffic control systems, supporting both government transportation agencies as well as peripheral technology customers. Solace, the leading provider of open data movement technology, combines with Hazelcast, the fastest in-memory data grid, to accelerate the processing of global data workloads. Solace integrates with Hazelcast to provide a distributed publish/subscribe backbone that enables remarkably fast, efficient cluster synchronization across WANs. This joint solution enables multi-cloud and hybrid cloud replication of Hazelcast clusters for worldwide operation with enterprise grade reliability, massive WAN scale-out and low latency cluster replication. In this webinar, Michael and Viktor are going to describe some example applications of this solution such as financial institutions that synchronize real-time position books and mobile carriers that use in-memory operational data to provide a fast and seamless end user experience. Solace provides a robust, scalable data movement backbone that intelligently routes real-time information between your organization's applications, connected devices and people.